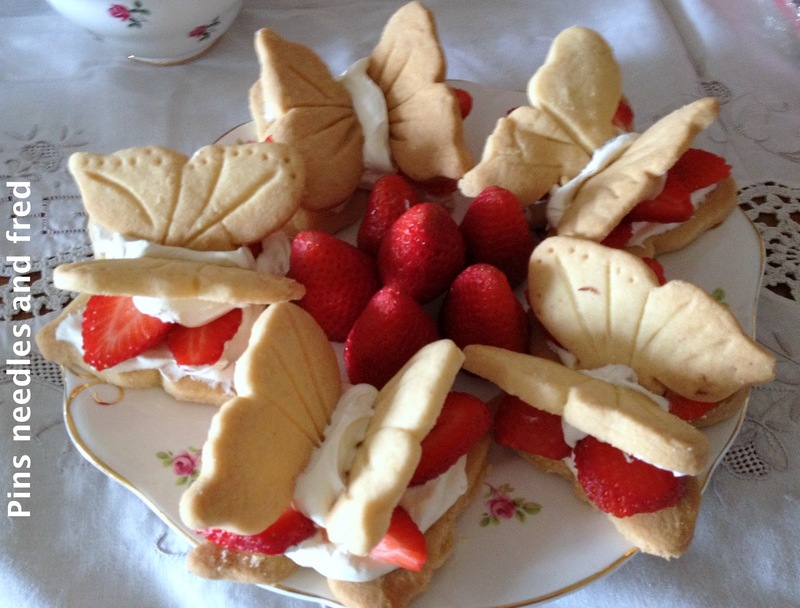 A friend of mine gave me a butterfly cutter that came with a cake decorating magazine, I was having a tea party for friends and thought it would make a different version of the strawberry shortcakes. Mine were just a simple outline of a butterfly but you may be able to get the push button ones from a cake decorating shop that does the impression as well as the cut. You will discover there are two types of shortcake recipes some versions create a softer mix which is added to a shortbread mould, but this recipe requires a mix that can be rolled out. Many recipes will allow you to use either butter or margarine, but for shortbread it really does have to be butter, it is not only traditional but gives shortbread its taste, using margarine will give you a bland tasting shortbread. I know butter is very expensive compared with stork, but if you are going to the trouble to make something why scrimp on the ingredients? To decorate: Whipped cream, strawberries and a little strawberry jam. If you are using fresh cream you need to keep them in the fridge until ready to serve, or you could use buttercream. Using a fork, gradually mix in the semolina and flour until the mixture finally comes together, try not to handle it too much or you will lose the air from the mixture. Press together to form a large ball and then place on a floured surface. Flour your rolling pin and roll out until it is about 1/2cm thick. Starting at the edge of the dough, cut the butterfly shapes out carefully – press into the mixture and then use a fish slice underneath to transfer to a greased baking tray, then remove the cutter. It helps to maintain the shape of the butterflies. Make in pairs cutting the second butterfly along the middle to divide the top wings, move the wings slightly apart from each other so that they will cook separately. Using a cocktail stick or a butter knife, make indentations to the wings like a butterfly. Keep cutting the butterflies in pairs until all the mixture has been used up. Bake in a moderate oven, 160c / 325F or GM 3 for around 20 minutes, until golden brown. Do not touch the biscuits until they have cooled a little as they will be very soft and fragile. After 20 minutes or so gently ease them off the baking tray and put them on a cooling rack, until they have cooled down completely. (essential as the cream will run if the biscuits are hot). Take one of the flat butterfly biscuits and place two teaspoons of cream and half a strawberry on each side, and cover with a small spoonful of jam. Add another small spoonful of cream in the centre, and then press the inside edge of the wing into the centre cream and allow to gently rest on the strawberry. Repeat for the other side. Continue until you have created all your butterflies. You can dust with a little icing sugar if you wish, or some edible glitter, and serve.